The pharmacy Treated.com is one of the best sites selling drugs on the internet. You can find all of the most requested treatments in a few clicks and receive them within two working days directly at your home. This enthusiasm for online pharmacies and clinics is quite recent and many people now wish to benefit from attractive rates, serious customer service and reliable treatments without having to move from home, with the utmost discretion. It is this set of needs that the Treated.com website tries to respond at best. This detail element of guaranteeing customers unparalleled security in the purchase of their online medication is one of the points that is most appreciated by consumers. Indeed, many are now informed about the drifts that are common on many online pharmacies looking to sell stocks of « me-too » drugs that are produced in India or China. This promise is not just words in the air. The Treated pharmacy respects a list of good practices that allows it to rise to the top of the best pharmacies that offer the sale of treatments online. This pharmacy registered with the body responsible for regulating pharmacies in the United Kingdom displays in a very visible way the links to its registrations. This total transparency with its customers allows it to convey a very good image online and an excellent reputation on specialized forums. Always continuing with total transparence with its customers and visitors, the pharmacy is registered with the site which regulates all the players for the sale of drugs in the United Kingdom. This site is a reference player which carefully selects the pharmacies that it will register and acts as a policeman to highlight the drift that may happen on this sector. On Treated.com, you can discreetly order all kinds of treatments. Even if they require a prescription, registered doctors will be in charge of validating your prescription following the form that you will fill on this site. We will return in detail on the ordering process but be aware that all the professionals involved are all approved and registered with the General Medical Council. What was missing was a reliable site to enable you to carry out your order with complete peace of mind. The online pharmacy Treated.com uses a secure connection (identifiable with mention of https in your browser). This means that nobody will be able to intercept your confidential data. Navigation is thus guaranteed without risk to allow you to make your purchases reliably on their site. Discretion is also one of the criteria of choice for people who turn to online sites. They can find the medications they usually take without having to consult their physician or request a specific prescription to initiate new treatments. From your first visit, you will notice that this site has been designed for all profiles. Whether you are comfortable with online shopping or not, this site is very user-friendly and offers all the features expected. Thus, you can find your best treatments in a few clicks thanks to the search form or a categorization of the symptoms and diseases treated. In order to help people who discover the site for the first time, you can follow the order process below to be accompanied in your first order in this online pharmacy. 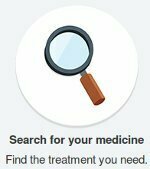 When you first browse the site, you will be able to browse the different sections of the site to find out more about all the treatments they offer to their patients. These drugs are all derived from the main pharmaceutical laboratories and Treated ensures their authenticity thanks to a seamless traceability. All the companies whose treatments are listed are all the biggest players and pharmaceutical laboratories that you could just as easily find in your local pharmacy. Although the pharmacy is Anglo-Saxon, you will notice that all the cards detailing each drug are all very well supplied. They detail the dosage, offer a complete description, tips for using the list of side effects as well as a list of frequently asked questions and answers in order to answer any questions you may have in mind. Many medications require a medical prescription and are not available in self-service purchase. For the latter, you will have to complete a medical questionnaire that will allow an accredited doctor to validate that there are no risk based on your situation. Some cases such as pregnancy, use of another drug, very intense alcohol consumption may not be recommended with the use of certain treatments. For this, an online form with a few questions will help you make sure that you do not risk anything with the treatment you want. Filling out this questionnaire is usually a formality while exceptionally allowing the medical expert to apply his right of veto for certain situations that he considers extreme. The delivery and deadlines are to be taken into consideration when you buy on the internet, especially when the company that will send you the parcels is abroad. The advantage of Treated is that they can receive parcels within one to two working days. This means that if you place your order early enough in the day, with luck you will be able to receive it at home the next day, but generally you can count two days while it is treated on at the pharmacy, prepared and transmitted to the UPS carrier responsible for delivering to you. In order to simplify your next order, the Treated site retains all the information that you will have communicated to it. You will thus gain precious time in your future orders with all your information already registered in the database. Do not worry: the pharmacy is committed not to resell your data or to use them for any other purpose than to bring you the best use of their service. Many customers buy several times in this pharmacy, very satisfied with their authenticity and the quality of the medicines offered by the latter at very competitive prices. Through the internet, it is possible to know from customers in order to assess the reputation and authenticity of a site. To do this, we rely on the reviews of consumers collected nominatively on sites such as TrustPilot. The latter highlights that the reputation and reviews of the Treated Pharmacy are excellent. These notations are objective since it is the response of all Internet users made following their purchase on the site. When we take a closer look at the evaluations and reviews left by the patients who have bought on this site, we see that there are always issues with delivery such as delays that force the carrier to come back on another day. These problems are exceptions and are common to all merchant sites as soon as a carrier intervenes to deliver your package. Nevertheless, they remain very exceptional and weigh very little in our overall assessment of the site. In a fully independent capacity and based on our field investigation on many online pharmacies, we amaze a very favorable opinion for anyone who wants to buy their medication on Treated.com.